Make your afterschool program stand out by starting a Yoga program with these complete and easy to use resources! 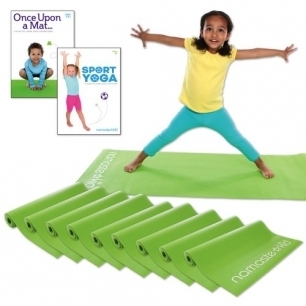 The Once Upon a Mat DVD brings your child on exciting yoga adventures, including an African safari, a trip to outer space, and getting caught in a thunderstorm! The Sport Yoga DVD engages your child in yoga poses set to their favorite sports, including basketball, baseball, and bike riding! Perfectly sized for young children, this lightweight kids yoga mat will help your students explore yoga poses with confidence. The waffle texture offers a comfortable grip and the durable cushioning easily wipes clean. Kit includes the two DVDs and 10 yoga mats.